*For Gr:2 HM's treating 5yrs completed yrs as Long standing instead of Aca.yrs. 2. Further, under Right to Education (RTE) Act 2009, every child in the age group of 6 to 14 years is to be provided upto Eight years of Elementary Education on admission to an age appropriate class in the vicinity of his / her neighborhood. 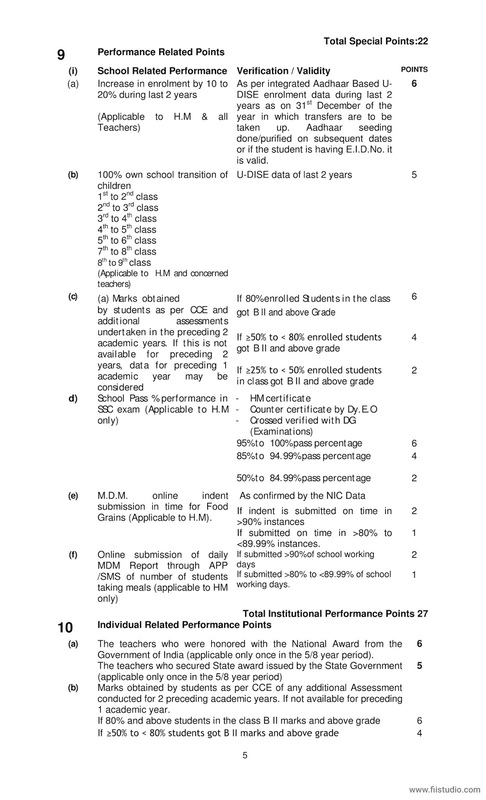 Further, there is a need to rationalize the staff in schools and posts in Primary, Upper Primary and High Schools as there are some schools with higher enrolment of students vis-à-vis the sanctioned teaching posts and on the other hand there are some schools with uneconomic enrolment of students with more the justified teacher posts. Government desires to ensure appropriate school/class level teacher – pupil ratio and strengthen academic monitoring / support to teachers at mandal and divisional level. Keeping the above in view, there is need to regulate the staffing pattern by way of transfers. 3. The Commissioner of School Education will take action to call for the applications for transfer of teachers through online and conduct web counseling duly obtaining the options every year after the closure of academic session for that year. A proper time schedule would be announced by the Commissioner of School Education for this purpose which will lay out all the details including time frame for application, counselling, grievance redressal, issue of orders and relief and joining of HM/teachers. 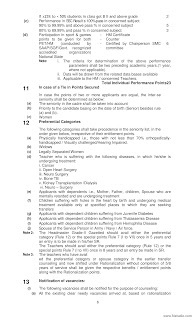 The Headmasters/teachers shall apply online at the IP address given for the purpose. 4. For the purpose of Transfers of Teachers, the assessment of Teacher posts required in any school will be based on U-DISE of the previous academic year with cutoff date as 31st December. 5. In exercise of the powers conferred by Section 78 and 99 of A.P. 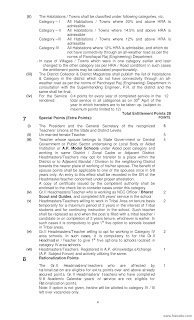 Education Act 1982 (Act 1 of 1982) and under Article 309 of the Constitution of India and in supersession of all the earlier Rules and guidelines on transfer of teachers, the Government of Andhra Pradesh hereby makes the following Rules regulating the transfers of the categories of Headmasters Gr.II Gazetted, School Assistants and Secondary Grade Teachers and their equivalent categories in the A.P. School Education Service and in the A.P. School Education Subordinate Service working in the Government Schools and Z.P.P. and MPP Schools in the State. 7. Government in the Department of School Education, shall be competent to transfer teachers if required, on administrative grounds, outside these rules/framework and time schedule during an academic calendar. 8. 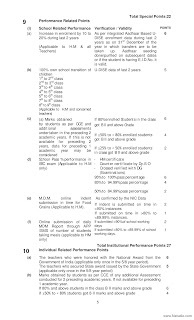 Work adjustments orders to shuffle teachers can be carried out by the Commissioner of School Education during an academic calendar year to ensure proper and optimum utilization of HM/Teachers in schools wherever their services are required for the purpose of better academic performance of the students. The teachers being shifted on completion of the Rationalization exercise (i.e.) Primary Schools, Upper Primary Schools and in High Schools shall be preferably posted to those schools where such new posts have come up due to rationalization. In case such Teacher is not willing for that, they can be allowed to participate in the transfer counseling by following the norms. 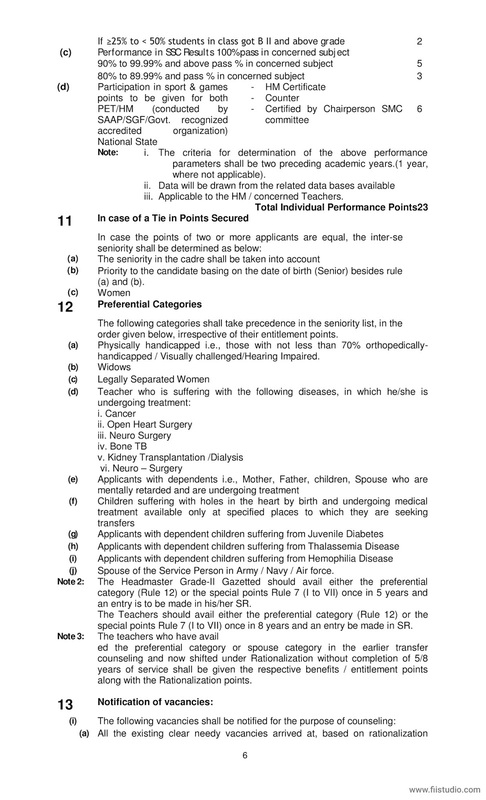 Criteria for identification of teachers being shifted on Rationalization: Junior teacher as per the service in the cadre. If senior is willing, senior teacher may be shifted duly obtaining a declaration counter signed by the inspecting officer concerned. Requirement of teachers in such schools where inadequacy of teachers exists would be preferred. 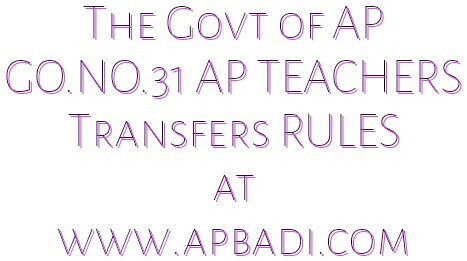 Transfers shall be effected from within the Present Management in which the teacher / Headmaster Gr.II is working. If the Teacher / Headmaster Gr.II desires to go to his / her parent management such Teacher / Headmaster Gr.II may opt for transfer to only those vacancies available in their parent management. 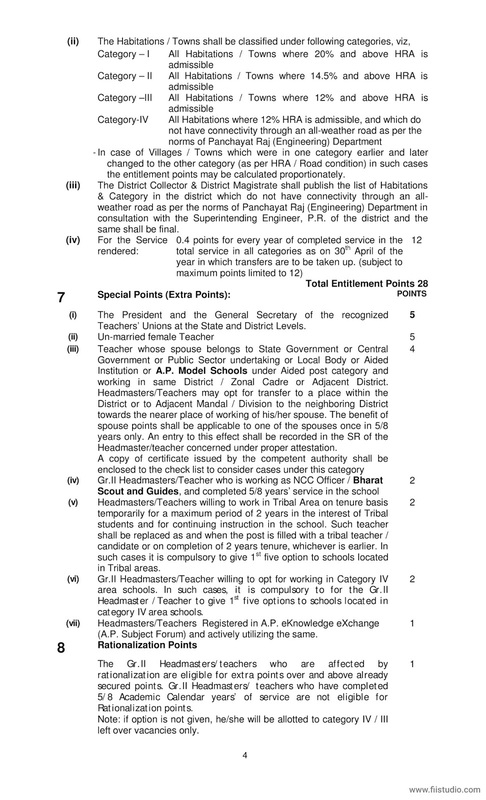 As per G.O.Ms.No.3 Tribal Welfare Department, Dated:10.01.2000, Headmasters/ Teachers belonging to local tribes are to be posted in Agency areas. 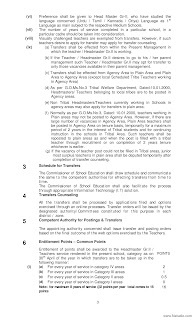 Non Tribal Headmasters/Teachers currently working in Schools in agency areas may also apply for transfers to plain area. Normally as per G.O.Ms.No.3, Dated: 10.01.2000, teachers working in Plain areas may not be posted to Agency Area. 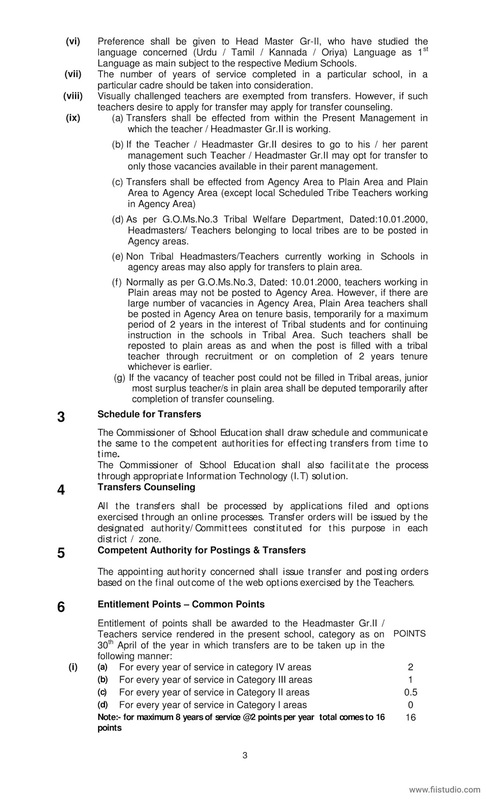 However, if there are large number of vacancies in Agency Area, Plain Area teachers shall be posted in Agency Area on tenure basis, temporarily for a maximum period of 2 years in the interest of Tribal students and for continuing instruction in the schools in Tribal Area. Such teachers shall be reposted to plain areas as and when the post is filled with a tribal teacher through recruitment or on completion of 2 years tenure whichever is earlier.